who goes by the stage name of Tom Male, is a beloved figure in Haitian comedy, not only by his fans, but also his colleagues. Born with a funny-bone, Laguerre incited his family and friends to fits of laughter whenever he was around. He was, not surprisingly, named the funniest boy in his class at school. After high-school Tom Male began working the comedy circuit, amassing legions of fans and attracting the attention of Boston entertainment manager and record producer, Marc Sam Dalzon. Dalzon saw Laguerre's potential and became his agent. With Dalzon's support, Laguerre began auditioning for TV comedy roles, achieving success, and building a resume of TV, film, recording, and commercial vice-over credits. Dalzon, who owns a record company, marketed Laguerre aggressively. He made several original recordings, a release of cover material, compilations, and a best-of CD. 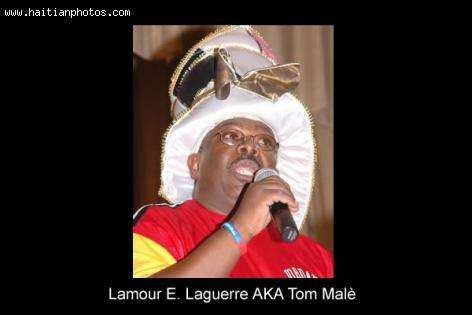 In honor of Lamour E. Laguerre, Tom Male, not to forget Manmi Pwela's many years in the entertainment field, his many accomplishments, and legendary support and generosity towards up-and-coming comedians, his colleagues roasted him in a birthday celebration, "The Original Haitian Kings of Comedy". It took place in New York City at Holy Cross Church Auditorium, and aired simultaneously on radio program, Radio Pa Nou. Haiti's best comedians showed up to roast Tom Male AKA Manmi Prela and wish him a happy birthday. They performed for fans from Haiti and the Diaspora in Florida, Massachusetts, Connecticut, and New Jersey. Laguerre, in a moment of gratitude, credited Dalzon for starting his career, remarking, "If I'm here today, it is because of him."